YEREBATAN SARNICI - Solvotek Mühendislik ve Bilişim Hizmetleri Tic. Ltd. Şti. YEREBATAN SARNICI - Solvotek Mühendislik ve Bilişim Hizmetleri Tic. Ltd. Şti. One of the magnificent ancient buildings of Istanbul is the Basilica Cistern located in the southwest of Hagia Sofia. Constructed for Justinianus I, the Byzantium Emperor (527-565), this big underground water reservoir is called as “Yerebatan Cistern” among the public because of the underground marble columns. 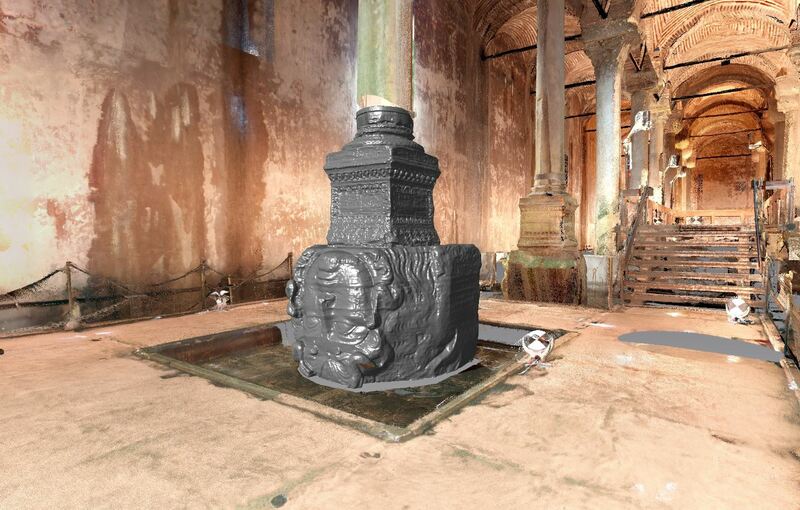 As there used to be a basilica in the place of the cistern, it is also called Basilica Cistern. The cistern is 140 m long, and 70 m wide, and covers a rectangular area as a giant structure. Accessible with 52-step staircase, the Cistern shelters 336 columns, each of which is 9 m high. Erected at 4.80 m intervals from one another the columns are composed of 12 rows, each has 28 columns. Solvotek was requested to 3D laser scan Yerebatan Sarnıcı with high resolution and HDR imagery to be used as a base for asbuilt drawings. Section, plan and elevation orthophotos were delievered.